I have bought vodka sauce in a jar before and loved it, but I have never made it. I thought I would give it a try and wow was it good! I call this semi-homemade because I used pre-made marinara sauce. This worked out well for me because I made it one night after work and was looking for something quick. But, feel free to make your own sauce! Don’t worry if you don’t drink alcohol or about the kiddos, because the alcohol evaporates when you cook it. This is seriously one of my favorite pasta dishes and I am planning on making it much more! In a skillet over medium heat, drizzle olive oil and add onion and garlic. Sauté. Add Sausage. Cook until lightly browned. Slowly stir in vodka, scrapping up any browned bits in the bottom of pan. Reduce heat to medium-low and stir in pasta sauce. Simmer 8-10 minutes, stir often. Stir in your milk and cheese. Drain pasta and add to your sauce. Stir to combine. *Don’t over cook pasta. Water will turn yellow and get a little thick, that’s normal! 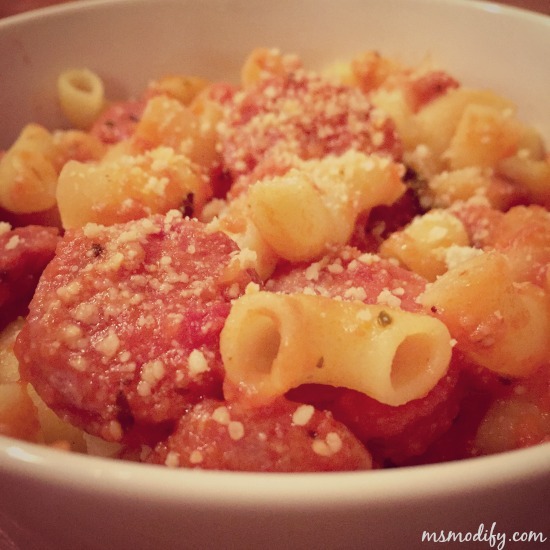 This entry was posted in Recipes/Dining Out and tagged dinner, pasta, sausage, vodka.